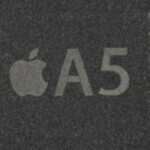 Processor on next Apple iPhone to be produced via Samsung's 32nm process? With no official word from Apple on what will be in the innards of the next iteration of the iconic iPhone (that's called alliteration, folks! ), a website called Chipworks decided to take an x-ray of the chip powering the new Apple TV 3. What it found was the next generation A5 processor, but with some interesting new features. 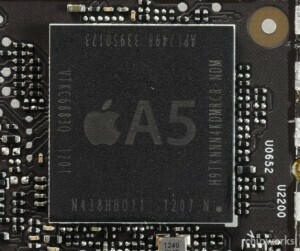 While the media was calling the new A5 a single core application processor, the x-rays revealed that the A5 in the third generation of Apple TV is actually made with dual-cores. But how could this be, you ask? Even Apple's specs sheet lists Apple TV 3 as being powered by a single core application processor. The answer is that either Apple is using just one of the two cores, or it is binning one of them. This is a process used when a initial runs of a new process result in lower yields. The "bad core" is disabled allowing the manufacturer to increase the number of usable dies per wafer which lowers costs. 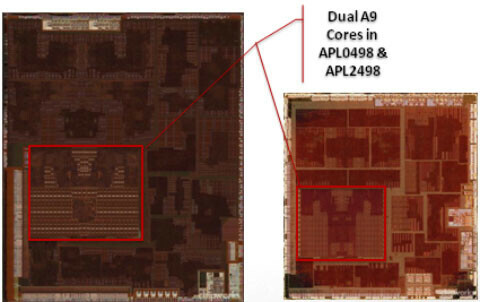 The A5X chip in the new iPad had both cores enabled, of course. 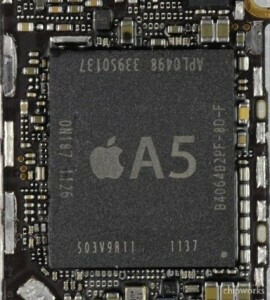 Besides the surprise of finding the dual-cores on the x-ray, Chipworks also found that Apple had used an A5 made with a different manufacturing process. Whereas the previous generation A5, part number APL0498, was manufactured using Samsung 45nm LP CMOS process, the new A5 was produced using Samsung’s new 32 nm high-k metal gate, gate first, LP CMOS process. This is APL2498. The new Samsung manufacturing technique shrinks the A5 by 41% compared to its predecessor and reduces current leakage. The question is, if Apple is using this complex technique on a product like Apple TV 3, is it just warming up for its use inside the next Apple iPhone? Samsung has used its own high-k metal gate manufacturing process with the dual-core Cortex-A15 Exynos 5250 processor and the unnamed quad-core Cortex-A9 Exynos processor which is expected to power the Samsung Galaxy S III. Samsung, of course, has produced the other "Ax" chips used in the 3 other versions, so the Korean based manufacturer should be coming right back with the production of the A6, or whatever Apple decides to call the next-gen processor. How can Apple get their hands on the patents for Samsung's processes, when Samsung already owns them???? More importantly, Samsung licences the architecture of these ARM cpu's from ARM.. So in reality what can Apple actually do? - That's right, nothing. In any case, Apple is at the mercy of chip manufacturers, and unless they buy one like TSMC, they always will be. Apple these days would have little to no technological advances in its products if it weren't for dealings with Samsungs. Its making even more and more sense to see why Samsung own galaxy s phones keep winning phone of the year awards. Lol iPan. Uve been drinking to much iJuice.... iNtoxicated! yeah i get that but would you rather have a dualcore or a quadcore? I'm not a big expert at this: It depends on lots of things. architecture, the nanometers and that kind of s**t that I don't have a clue about. :D Of course I would prefer an n-core before an n-core processor ONLY IF it truly had better performances. I've gotten an impression that you were a kind of guy who would brag about his phone only because of the number of cores. A x86 dual-core and a Cortex-A9 Octo-core, what would you prefer ? Quadcore is BS for iOS. because it doesn't have the true multi-tasking, 2 threads only are enough. That's a advantage, and also the limit of ios. Android is f**king sluggy compared to ios, but it was the past. When the CPU is more and more powerful, it'll smooth like iOS but much faster and you can see a true multitasking device. Android's already ad smooth as iOS. Has been since Gingerbread. The only reason it used to lag was the multitasking - it does more at once than iOS. But, hardware has caught up. My Thunderbolt, with Eternity r248, which has gingerbread on a single core 1.4ghz snapdragon is buttery smooth, no lag even with 4 or 5 concurrent apps running. Blame Verizon for its out of the box performance - they ruin every phone they release. With ics, Android is every bit as smooth as iOS, while being more powerful. It comes down to individual preference, there's no performance reason to choose one or the other. I'll admit, I tried the 4s as well, and the POS wouldn't last 12 hours on iOS 5.1, my RAZR lasts at LEAST 48 hours, and has never crashed on me, it has been perfect. I do plan on buying the iPhone 5, but to use it as a glorified iPod Touch, they keep throwing us iTouch users under the bus. i guess you haven't used an iOS device I'm not saying it doesn't lag or anything because it does but the main reason why iOS devices are smoother in day to day operation is due to the hardware acceleration which GB doesn't have(outside of samsung's TW4.0) That's the beauty of ICS (btw nexus also lags occasionally) As for the performance reason to choose one over the other, there is a damn good reason. As smooth as iOS since Gingerbread? Come on, don't be silly! I'm a huge Android fan, but this is just rubbish. ICS is now only just APPROACHING the smoothness of iOS, and that's with kickass hardware. And the lag is still present in some areas. Sorry, but iOS (and WP) are the smoothest around. Android wins in other areas, but being the smoothest is not one (yet). come on are you saying they copied the idea of a slab of glass with bezels. I certainly have no problem with Apple...but some morons who use Apple gadgets!